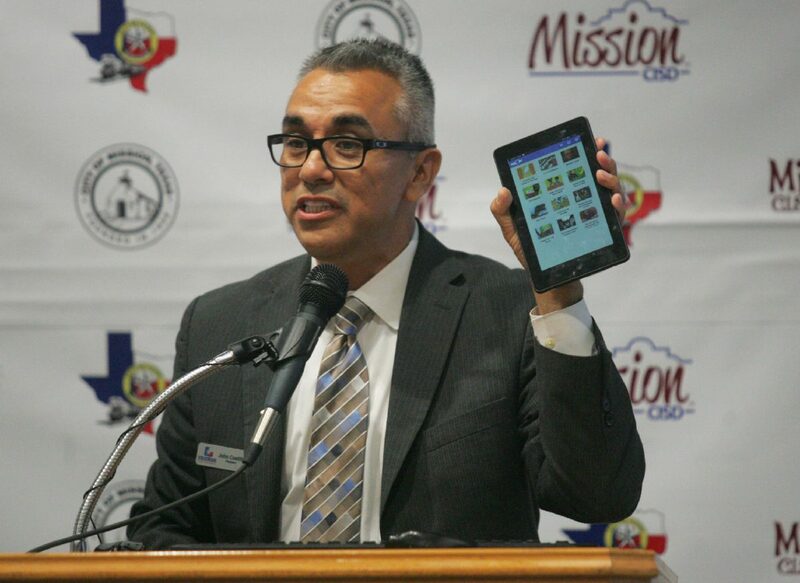 John Costilla, president for Friends of Texas Public Schools, holds up a digital device as he talks about myOn, a library of digital books, at Mission CEED May 5, 2017 in Mission. MISSION— In an effort to encourage literacy in children well before school age, the Mission Consolidated Independent School District and partner cities are focusing on providing access to online books to the entire family. The program is called Mission CISD Reads and was formally launched on Friday after months of planning, Lopez said. After looking for ways to tackle the illiteracy rate — which in Hidalgo County is at about 50 percent, according the National Center for Education Statistics— the district partnered with the cities of Mission, Alton and Palmhurst to launch this program. The cities agreed to pay for a portion of the subscription to the online library called myON and advertise the initiative. Through this platform, users can access the online library on a computer or device with internet access and keep track of their reading. The district will also have access to data such as number of users and number of books read. The district and the cities agreed to a five-year subscription, paying about $146,000 per year, Lopez said. But the idea, Lopez said is to analyze the usage every year to measure success and verify if there are any needed changes before renewing the program on the fifth year. The idea was born out of seeing positive results with similar projects in high-poverty areas in California and Florida, he said, and once the district approached its serving cities, the positive reaction and support was immediate. The books are available in English and Spanish and offer read-along options for those who are learning to read as well as books suitable for new and avid readers. The district and the cities will advertise the program along with other partners such as churches, hospitals, and Head Start programs.